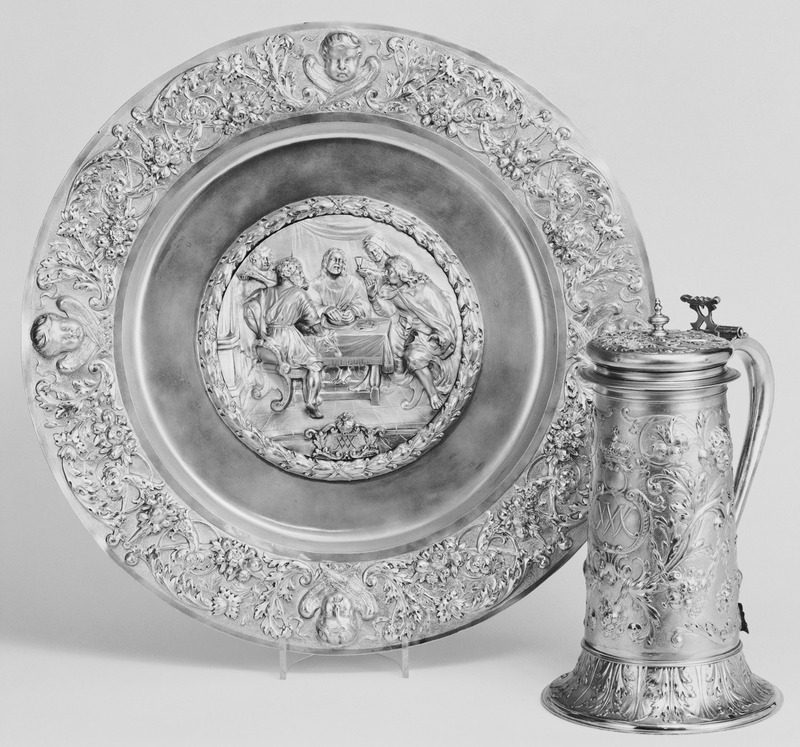 Silver-gilt dish, the centre in high-relief depicting the scene of the Supper at Emmaus; Christ is seated centrally and flanked by the disciples; at a step in the foreground is a cartouche with the cypher of William III and Mary II; embossed and chased border with winged putti heads, fruit and garlands. This dish and accompanying flagon (RCIN 31752) were made specifically for the Church of St Peter ad Vincula in the Tower of London. They feature in a warrant issued by the Earl of Dorset as Lord Chamberlain to Sir Francis Lawley, Master of the Jewel House, 26 December 1691, which requires delivery to, 'the Ld Lucas Gouvernour of their majesties Tower of London for the use of their Majesties Chappell there one silver fflagon guilt and chased and one silver Bason guilt and chased.' The receipt of the pieces was acknowledged by Lucas on 14 April 1693, as 'one large Gilt Bason and one large fflagon 325-0-0'. The present weight of the two pieces is 327oz 6dwt, the difference being accounted for by later repairs and regilding. The apparent delay in the delivery from the original order is probably accounted for by the time taken for the extremely finely executed chasing of both pieces by an unknown artist. The pieces do not appear again in the Jewel House records until 1779. The flagon is depicted in Nayler's Coronation of George IV, carried by the Bishop of Chester and wrongly styled, 'The Chalice'. Both the flagon and basin were used during the coronation of William IV and continue to be used at modern coronations. This altar dish and the flagon (RCIN 31752) were made specifically for the church of St. Peter Vincula in the Tower in 1691.